I have written this Foreword to the forthcoming book edited by Kjersti Fløttum, ‘The role of language in the climate change debate‘, due out with Routledge in 2017. In March 2015 the BBC screened a 90 minute TV documentary titled ‘Climate Change by Numbers’. The programme aimed to improve public understanding of climate change by focusing on “just three key numbers that clarify all the important questions about climate change”. The three numbers were 0.85 (the degrees Celsius of warming the planet has undergone since 1880), 95 (the percent confidence climate scientists have that at least half this warming is human-caused) and 1,000,000,000,000 (tonnes of carbon it is estimated humans can burn to avoid ‘dangerous climate change’). Climate change in just three numbers? There is of course the long-standing convention that holds that climate can be defined statistically, as the aggregation and average of (usually) 30 years of standardised meteorological measurements in a place. If one allows for 10 weather variables, measured twice-daily over 30 years, then the climate of a location would then be described by 219,000 numbers. But that is before one re-calculates these numbers over a different period of time to determine how the climate of that place has changed between two periods. So, 438,000 numbers. And that is just the climate of one location on a planet with many different climates in different places. My own early fascination with climate and its changes was triggered by just this love of numbers and the many ways of manipulating them. As a boy I would pour over the daily weather statistics in the local newspaper and then later as a university geography student I would gather together historical weather data from UK meteorological stations to calculate trends in UK winter climate. It was this that placed me on a course of study which was to lead to my career as an academic geographer and professor of climate. 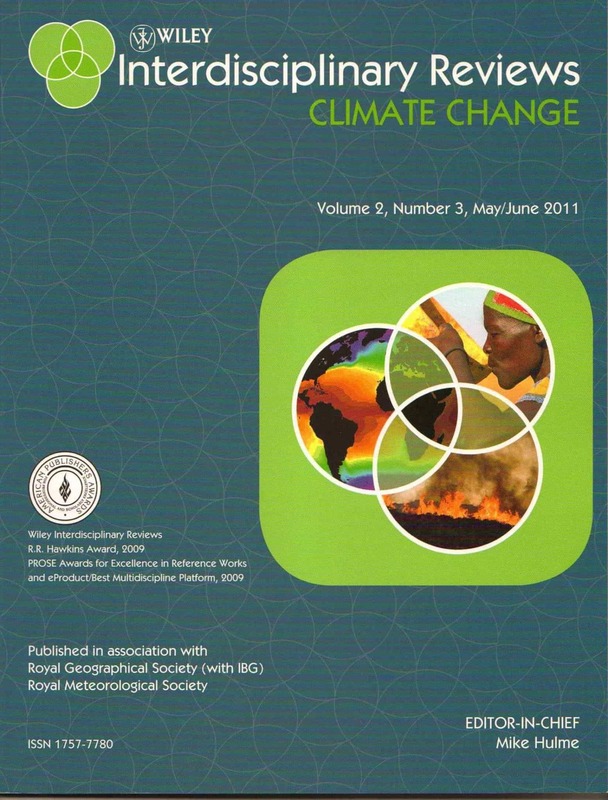 And it is through enumerating the physical processes of the Earth system and how these processes can be represented by mathematical equations and solved in computer models that the scientific knowledge assessed by the Intergovernmental Panel on Climate Change (IPCC) has come into being. These IPCC knowledge assessments have informed and been interpreted by government officials and negotiators at successive meetings of the parties to the UNFCCC, a process by which the political dimensions of climate change have been identified and through which potential solutions are negotiated. Enumerated climatic knowledge has certainly come to be regarded by most commentators as the highest and most necessary form of knowledge during the 30 years over which climate change has emerged as a public policy issue. It is this form of knowledge which has inspired some to present climate change as “… the defining challenge of our age. The science is clear; climate change is happening, the impact is real. The time to act is now” (Ban Ki-Moon, 12 December 2007, COP13 in Bali). But there are other languages beyond numbers and mathematics that matter for public debates about climate change. Understanding the public meanings of climate change, and therefore the basis for Ban Ki-Moon’s demanded “action”, requires more than just numbers or scientific knowledge. Studying the ways in which climate change is talked and written about through semantic, visual and embodied languages, and in different vernaculars, is necessary if the multiple meanings of climate change are to be excavated. And only through the construction and articulation of meaning is personal and collective political action on climate change possible. Science or numbers alone is never enough. And so the last 10 years has seen a growing body of scholarship by linguists and anthropologists which has sought to understand the ways in which climate and its changes is represented beyond numbers. Amongst professional linguists, Kjersti Fløttum at the University of Bergen in Norway and Brigitte Nerlich at the University of Nottingham in the UK have led the way. This new book written by Fløttum and her various collaborators – ‘The Role of Language in the Climate Change Debate’ – is therefore a very welcome contribution to this broadening of understanding. 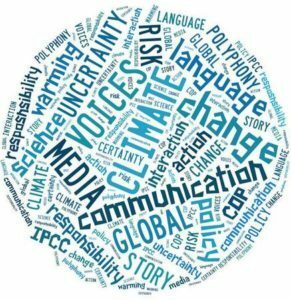 It’s focus on the linguistic and discursive elements of climate change communication – the importance of frames, narratives, metaphors, rhetoric, and textual analysis methods – reflects this growing international network of analysts. The collection of studies in this book brings us closer to the essentials of linguistic theory and communication practice as they apply to climate change. To find out what climate is (climatology), what it has been in the past (paleoclimatology) and what it might be in the future (climate prediction) is one thing. But to find out what climate change means to different people, in different places and in different times is something else. And here numbers are not enough. The three numbers in the BBC documentary — 0.85, 95 and 1 trillion – are clearly, on their own, inadequate. There is also a need to understand human language(s) and the central role it plays in the formation of public meanings and hence how language shapes the possibilities for political action. This need is well illustrated by the Climategate controversy that erupted back in the winter of 2009/10. For example, one of the most cited accusations about the integrity of climate scientists was based on the statement in one email from Phil Jones sent to his colleagues in 1999, “I’ve just completed Mike’s [Mann] Nature trick of adding in the real temps [temperatures] …. to hide the decline [in warming]”. Was this ‘trick’ a nefarious practice that subverted the ethics of science (by hiding a cooling) or was it merely a clever statistical device to bring visible order out of complex and chaotic data? Without a proper linguistic analysis of the word ‘trick’, and how the meaning of this word is constructed by communities of practice – which, after all, is how all language comes to mean anything at all – the ground was ripe for multiple and conflicting interpretations. And this of course is exactly what happened in the subsequent media and public frenzy about the trustworthiness of climate science. Language constructs the spaces within which different forms of political action take place. 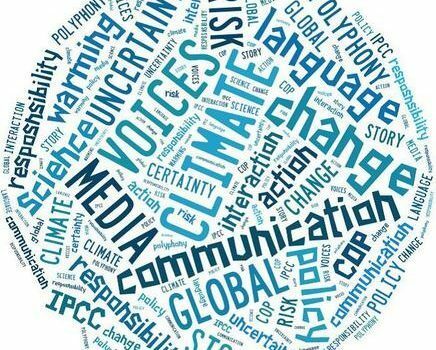 The IPCC, through its six-yearly assessments of scientific knowledge about climate, has slowly been learning its own lessons about the importance of language. One of the conclusions of the review of processes and procedures of the IPCC, prepared by the Inter-Academy Council in 2010 under commission from UNEP following certain public controversies, was that “communication was a major weakness” in the IPCC. It recommended a professionalization of its communication strategy and more careful consideration of the language used in its reports. And in February 2016 in Oslo, the IPCC held its first expert meeting on climate change and communication, with many recommendations including that “[IPCC] authors should be trained in writing and communicating, including the use of clear language”. As if to press this point home, recent analysis of the language of the IPCC’s Summaries for Policy-Makers (SPM) reports has shown their low readability scores in relation not only to mass media, but also other scientific publications (Ralf Barkemeyer and colleagues; Nature Climate Change 2015, DOI: 10.1038/NCLIMATE2824). And Kjersti Fløttum, the editor of this new volume, has pioneered other types of linguistic analyses of climate change texts. She has subjected IPCC SPMs and various national climate change policy documents to narrative and polyphonic analysis, to explain how different linguistic and discursive strategies are used to advance the arguments of the scientists or policy officials authoring these important climate change texts. There is no one way of telling the story of climate change and so being able to discern different voices and communication strategies in key texts such as these is of great public and political value. Nevertheless, there will remain limits to what can be achieved through the study of climate, its changes and its public meanings, whether this study be through numbers or through words and images. Such analyses may clarify different forms of knowledge and help identify reasons why specific disagreements and conflicts persist around climate change. And such analyses may explain the effectiveness of different forms of communication – metaphors, visuals, narratives, etc. – to different audiences and thereby inspire new communicative forms. Linguistic analyses too are useful for explaining the particular rhetorical tricks (that word again) that different political actors use on different occasions to persuade particular audiences about desirable futures and courses of action. Yes, we need to understand the languages of disagreement, of persuasion and of mobilisation. But climate and weather are also experienced bodily, through the senses, through memory and through livelihoods. These forms of knowing can sometimes exceed the human ability to communicate through words, which helps explain the growing engagement by creative artists – musicians, sculptists, dancers, painters – with the idea of climate change. These different forms of knowing also point to the different meanings, the different structures of reality, carried by words associated with ‘weather’ and ‘climate’ in the vernaculars of different regions. Here, the work of anthropologists becomes important. Climate change is not merely a physical phenomenon; neither is it only a cultural one. But beyond its inescapable material reality, climate change is an idea to which there is no end of meaning and therefore no final resolution to the challenges it presents to people. Although an idea that cannot be solved, language remains important to how climate change will be used to change the way people think, plan, argue, act and prepare for their futures. Living with climate change not only suggests the need for improved scientific literacy, it also suggests the need for improved literacy – better understanding of how language and communication works in public life, the interplay between language and action in the world. This book which Fløttum and colleagues have put together is a good starting point for such enquiry.